When people ask why I live in Pilsen, I’ll occasionally respond, “I’m half-Mexican and half-hipster, so it’s perfect for me.” It’s Andy Kaufman-esque in that it’s simultaneously funny and slightly uncomfortable. The real answer is that I moved to the area 16 years ago to be close to the (then) cheapest state school, UIC. Had I known that I’d never leave, I’d have bought a building back then (and subsequently gone broke via an adjustable rate mortgage)! I’ve been kicking around a blog post on this topic for some time, but a recent Facebook post and my upcoming talk about environmental justice and gentrification at Roosevelt University convinced me it’s time to publish it! What follows is an edited and extended version of my comment on that Facebook post. My grandfather grew up in the original Mexican neighborhood in Chicago on Taylor and Halsted. That got pushed into Pilsen by UIC’s construction. My grandmother lived in Pilsen back in the 40s. They had a home together at Racine and Harrison that got turned into a parking lot when UIC was built. My grandparents are in the middle surrounded by my great-aunts and uncles. (Ironically, it was the same parking lot where we would take my UIC graduation photos 50 years later.) When that happened they, like a lot of people, were able to buy a house in the suburbs on the GI Bill. I’m a product of that great river that starts around Pilsen and flows westward into the western suburbs. There’s a constant renovation on the westside of Chicago if we don’t screw it up now with our immigration policies. There’s always been a constant, almost like a river, of change on the westside of Chicago as one immigrant group after another flowed through it. Pilsen used to be a landing spot for Mexican immigrants. Some folks, like my great grandmother who lived above El Nopal Bakery into the 1990’s, would stick around. Others, like my grandparents, would migrate down “the great river” into Cicero, Berwyn; Burbank in their case. Four generations of the Hernandez family. From back left: My father, great-grandfather, grandfather. My oldest brother is center. What most people don’t realize is: Part of the reason Pilsen lost 10,000 Hispanics between 2000 and 2014 is that immigration from Mexico has been negative for a decade. People have always moved out of Pilsen! They’ve just been traditionally replaced by other newer Mexican immigrants. That’s no longer happening. That, in addition to the luxury housing boom happening all across Chicago, is why the affordable housing market in Pilsen has collapsed. Pilsen’s current depopulation is close in character to that of the 1930’s, 40’s, and 50’s. The population thinned in Pilsen by 27% following the Czech independence gained in 1918; new immigrants stopped coming and many established families moved to the suburbs. Moreover, the immigrants that are coming here aren’t predominantly Mexican. They’re Central and South American. That’s what is so confusing to me about Pilsen Alliance and their anti-gentrification campaign. They want to keep Pilsen a working-class Mexican neighborhood! … and then they have a wealthy Ecuadorean guy lead the fight.? Unless you want to argue that all Latinos are the same, a racist, offensive idea in itself, then Byron Sigcho is an example of the exact thing he claims to be fighting against: Change in Pilsen. My fiance is Puerto Rican. While we have shared experiences of growing up in majority White communities, our cultures are different. “Rice and beans” isn’t a meal, it’s a negotiation. I’m happy to have a beer at Pleasant House, ribs at Honky Tonk, Japanese cucumbers at S.K.Y. I’m thrilled to eat at the Jibarito Stop. Just make sure they’re hiring people in the neighborhood. If you’re too afraid to go into Pollo Express, you’re dumb and don’t deserve the best chicken in Chicago. Try the tamales and res en chile de arbol at La Casa del Pueblo. Need to make some flyers? Skip Kinkos and go to Tampico Press. We’re not going to change national immigration policy or fix a national affordable housing crisis by being angry at the middle class white people that can’t afford Lincoln Park or the West Loop. There are things we can do in Chicago to help change things, but being a marginally informed jerk isn’t one of them. Basic economics tells us that one person’s spending is another person’s income. New businesses bring jobs. If those businesses hire locally, then they are enriching our neighbors. Mixed income neighborhoods create upward mobility for children in low-income households. I know it worked for me. After my parents’ divorce, but before they found success, we were sleeping 5 to a bedroom and digging in couch cushions for lunch money. But we got a good education and grew up seeing that a better life was possible. Now I have a great job and own a home that I can be proud of. Whatever people new to Chicago might assume, not all Mexicans here are poor. We’ve been here for over a century. Some of us have climbed the ladder of success; not that it’s always a straight line to the top. So what can we do to keep Pilsen the mixed-income neighborhood that it’s been since the days of the Czech Freethinkers and the founding of the Gads Hill Center? Voting Cook County Assessor Joe Berrios out of office was a good start. His ad-hoc, regressive property assessments shifted billions of dollars of the tax burden from the wealthy to low-income and minority households. Nothing is more emblematic of my refrain that the Chicago Democratic elite are closet Republicans than his actions while serving as the chair of the Cook County Democratic Party. Property assessments can mean all the difference for our seniors on fixed-incomes. Additionally, we need to make sure that seniors are aware of the property tax exemptions for which they are eligible. A couple of years ago I talked with a city employee in the Planning Department who was disgusted that Alderman Solis was so disinterested in the program while other aldermen were actively promoting it. Another solution is community land trusts. This was championed by then-Mayor Bernie Sanders. You see some of this activity in Englewood and there is a new group in Pilsen, PiHCo, already working on it! From a business perspective, there are a few things we can do. Increasing the supply of units in the neighborhood will take pressure off of the existing housing stock. Unfortunately, or fortunately depending on who you ask, that will increase property values. If we require that Pilsen’s 20% affordable unit on-site requirement be met, this should help. If we don’t make the developer stick to the on-site requirement, then we’ll see that developer crowding out potential home owners by driving up the demand and the price. Lastly, we can demand that property developers rehabbing units abide by existing laws. As a home owner, I can demolish up to 1000 square feet of an interior unit without even acquiring a permit. Investors and property developers don’t have that right. Under the Lead Renovation, Repair, and Painting Rule, contractors who renovate or partially demolish pre-1978 residential buildings must be lead-safe certified by EPA and use lead-safe practices. When I demolished my house, I went through the effort of closing the windows, bagging the debris, and letting the dust settle before and after. When taking the debris outside I’d wait for rain or use a garden hose to minimize the dust. I used a respirator to minimize the dust that me and my friends inhaled. I showered at the building and used different shoes to minimize tracking that dust. While I made some mistakes along the way, I frequently went above and beyond the EPA’s requirements for contractors because I care about my health and my neighbors’ health. I don’t see this effort with professional rehabbers. Most notably was the rehab of the Payless Shoe Store building on 18th and Ashland. Windows and doors of the newly demolished stairwell were wide open when I passed by. The workers had no masks on. Other sites have had dumpsters overflowing with plaster likely covered in lead paint. By hiring unwitting and unqualified workers, property developers are increasing our neighborhood’s already high exposure to lead. If city inspectors were to enforce the Lead Renovation, Repair, and Painting Rule the city would get additional revenue from fines, then the environment would be improved, and the developers would be forced to hire safe and qualified contractors. This would drive up their costs, thereby making the purchase of an older home more affordable for DIY home owners. 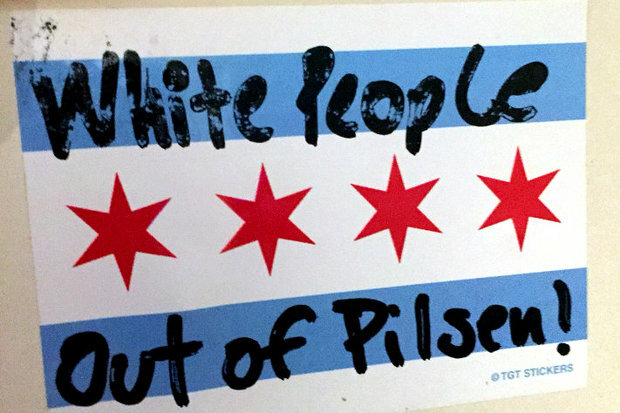 Pilsen’s changing character and gentrification is due to many reasons: National immigration patterns, a nation-wide affordable housing crisis, the reversal of White flight, the Machine using Republican-like regressive tax assessments and a willful ignorance of effective regulation. We don’t see any of the aforementioned solutions being championed by the current alderman. This makes sense. He owes his career to the champions of turning Democrats in Republican-light; the brothers Daley, Rahm, and even the Clintons. (Alderman Solis’s sister, Patty, was First Lady Hillary Clinton’s chief of staff and eventually ran Candidate Hillary Clinton’s 2008 campaign into the ground). That career includes being the chair of the zoning committee. In Chicago, alderman prostrate themselves before property developers for campaign cash. As the chair of the zoning committee, Danny Solis oversees this mockery of democracy. It’s not in his campaign’s interest to upset the status quo. Politics is advertising. Aldermen need that campaign cash to send you post cards of them kissing babies to remind you how great they are so that you forget the 99% of the time when they are screwing you over. Municipal elections are in the dead of winter (February 26th) and voter turnout is around 30%. Property developers vote. The supposedly extinct patronage employees vote. Will you?